I've heard a lot of people (usually fellow Americans and state-siders) aren't fans of 묵(muk.) The biggest complaints are a general aversion to the texture. It's strange, clearly foreign and something to adjust to. It's made with acorn powder (도토리묵-dotori muk), buckwheat starch (메밀묵- memilmuk), sesame seeds (깨묵-kkaemuk),or mung bean starch (녹두묵- nokdumuk) and it resembles jell-o. Muk is rumored to be very healthy, by that it's simply low calorie. 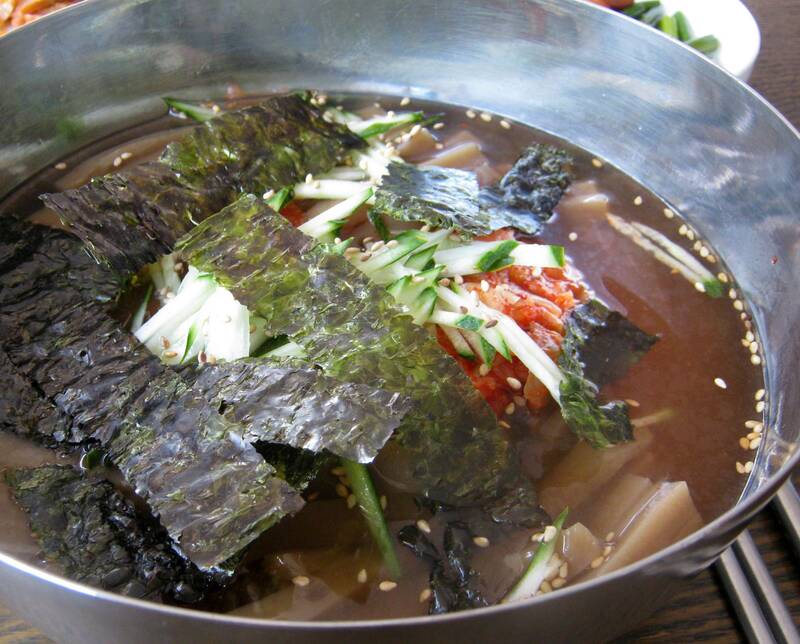 It doesn't have much flavor standing alone, so it is often seasoned with soy sauce, sesame oil, 김치, etc. I personally LOVE this stuff. I like the texture, it's firm, light, and fills you up. I always feel healthier after I eat it, and not weighed down. 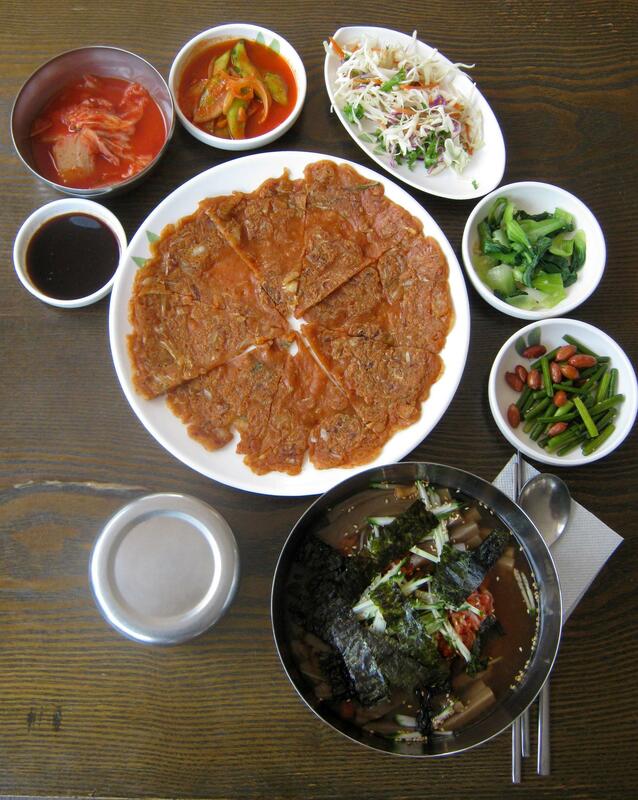 For me, anything with 묵 is the perfect summer meal. I've seen so many people throwing down 김치찌개 (kimchi jigae) and varieties of 라면 (ramyeon), and I've grown up with Korean meals, and spicy I can always do, but high temperature foods in the summer mess with my system. "You can taste the best well-being food make with Dotori (acorn) powder. Dotori based dishes, including Muk-bap (rice mixed with a type of jelly made from acorn powder), Dotori-muk Naengmyun (Dotori-muk served in chilled broth), Dotori Sujebi (soup containing acorn based dough flakes roughly torn by hand), Dotori Kimchi-jeon (kimchi pancakes made with acorn based batter) and Dotori Tukboki (broiled dish of sliced rice cake in hot pepper sauce) make your mouth water." Looking at the menu, my stomach was screaming...so I went for a bit more than I could chew. 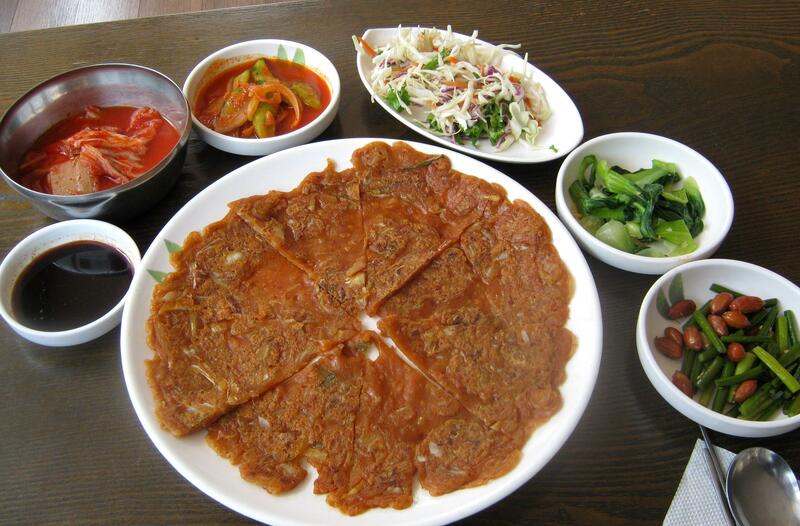 I order the 도토리김치전 (dotori kimchi jeon, dotori based kimchi pancake) and the 도토리국수 (dotori guksu, dotori in a light broth.) The broth they serve is made with a simple mixture of soy sauce, sesame oil, and vinegar...so no fear vegans! 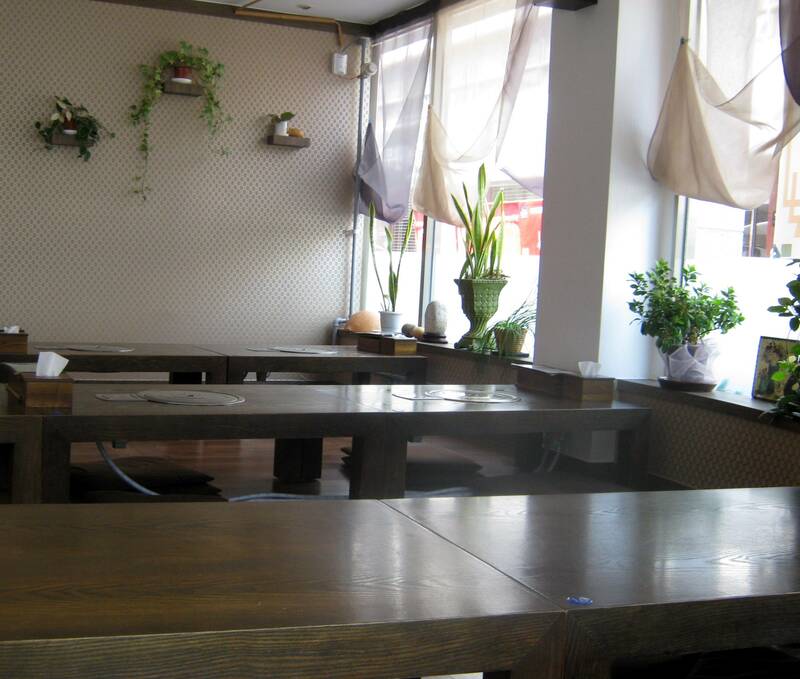 Al the 반찬 (banchan) served was vegan also. 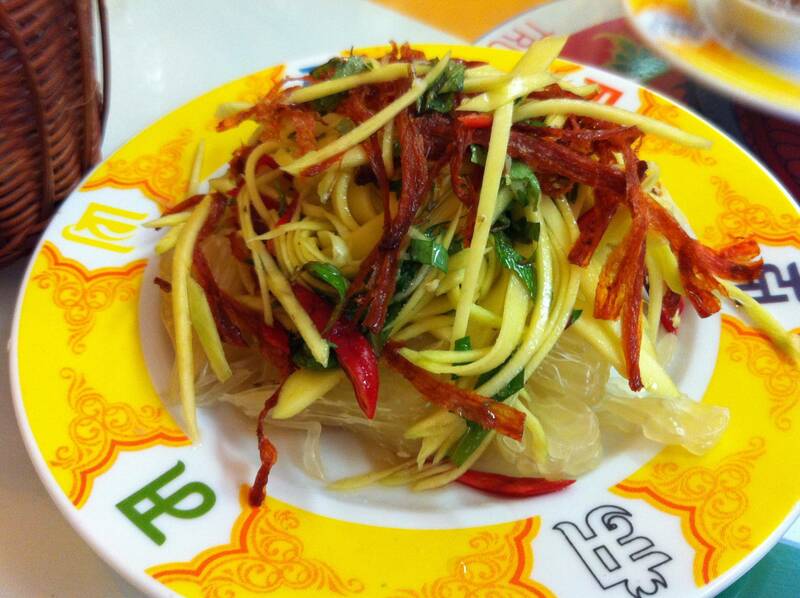 The 김치 was delightfully spicy and had enough juice to keep the cabbage dripping, like I said, I like spicy. The cucumber and onion 김치 was slightly less spicy but had ground asian pear in is, to there was a thick kind-of sauce what just burst with a sweet and savory flavor. I added it to the 전. The shredded greens (purple and green cabbage, chives, carrots, and mountain greens) were seasoned in a light vinegar based marinade (my only issue was that the greens were a bit old and droopy.) The bok choy was seasoned with vinegar, sesame oil, and garlic, and the garlic chives and peanuts were boiled in a light soy sauce. It tasted as if they were using light sodium soy sauce here, my face wasn't cringing and nothing overwhelmed the foundation ingredient in any of these dishes. The 도토리김치전 was great. 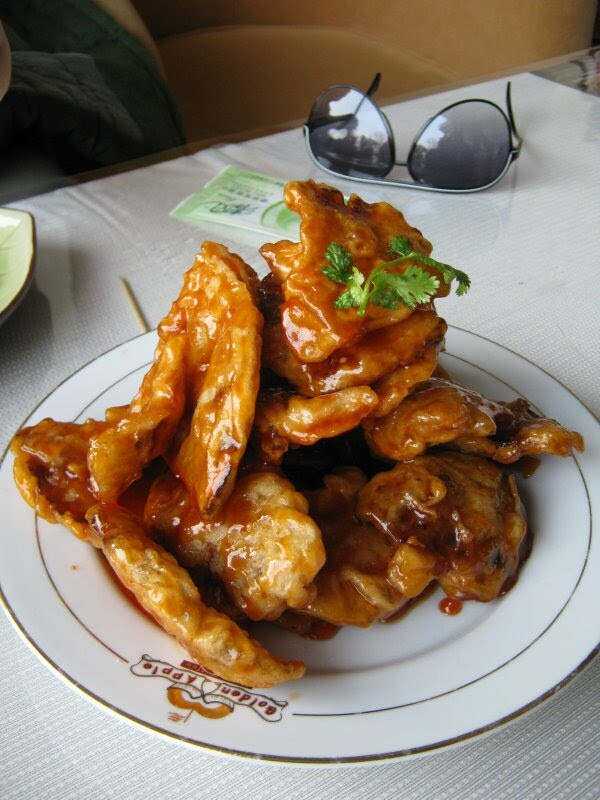 Crispy and cooked completely, and not dripping in any oil. Oil, it bother me, extremely so if there is a residue. I know you're using oil, but please, I don't want to be reminded!! The 도토리국수 (dotori guksu) was a good size portion, I could have fit my head in the bowl! 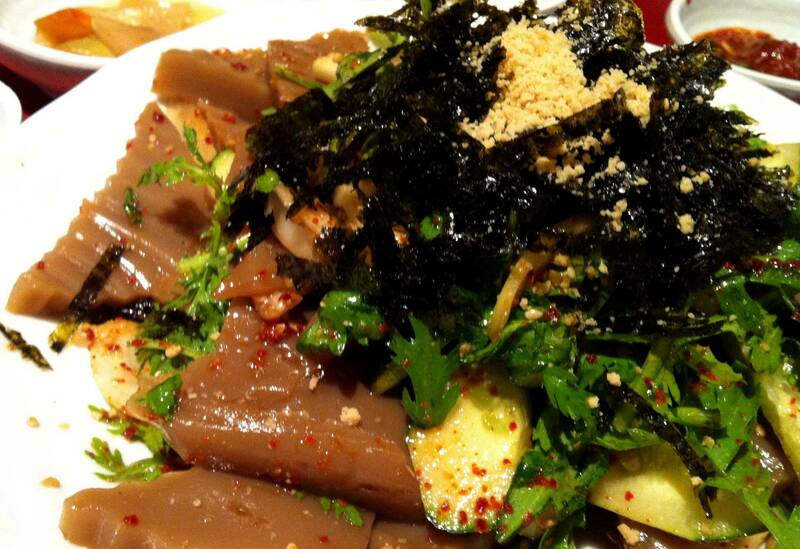 There was a generous pile of cucumber, 김치, and 김 (gim, seasoned laver) on top of the thin long slices of 도토리묵. The broth was fresh, cool, refreshing and invigorating. There was a delicate balance of vinegary sweetness and saltiness, the 묵 balanced it out very well. Everything seemed well measured and again, very balanced. I was more than happy with this place. I actually tried to come back on Sunday (it's closed on Sundays...womp womp!) I loved how fresh and balanced everything tasted (except the saggy veggies) and was surprised with the portion size. I am sure to be back here again, I couldn't finish all of what I ordered. Next time I will bring friends, this place needs to be shared! Great food, great service, good ambiance, peaceful...great muk!! It is rather difficult to explain how to get here, but I'll give it a shot. line 2, green line, go to Seocho station, exit out of exit 2. Walk straight and pass four roads on your left side...you will see Honda Motors on a corner, take the road on your left right before Honda. 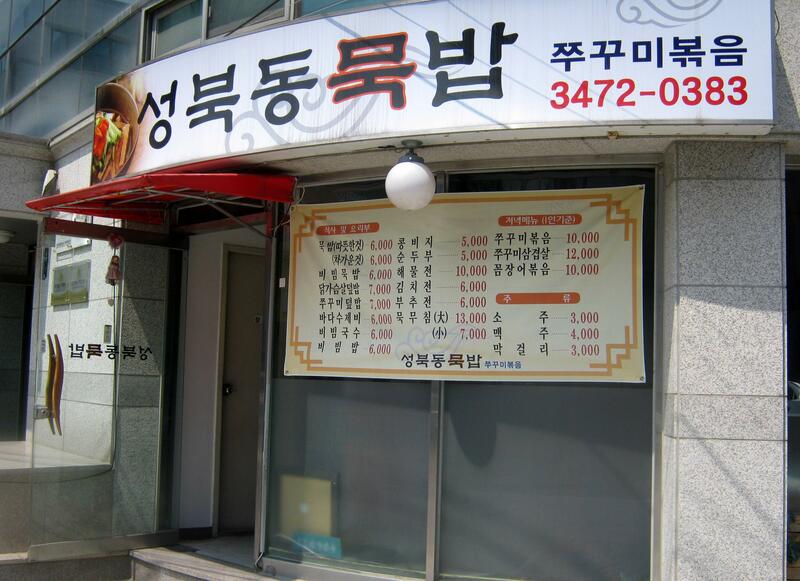 Walk for about 2 minutes, and 성북동묵밥(Seong-book dong muk bab) will be right in front of you, on your left side! Was the kimchi vegan too (ie, do you ignore the probable addition of fishy stuff, or is it actually vegan)? It was! I can't guarantee that it always is, but they told me that this batch they made was free of fish, shrimp, and any seafood. Always best to ask! !